I use Polylang (free) to internationalize a customer site. 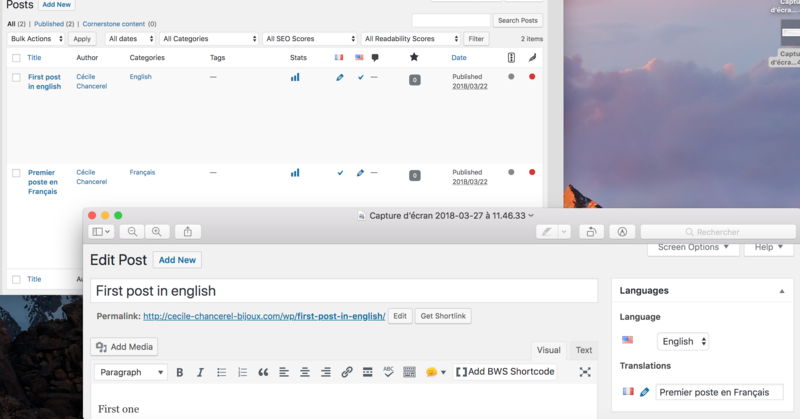 I set a default language (= FR), I added a language switcher in my navbar (FR and US flags) and I set the Front and Blog pages for both languages. 1) The language switcher works well with the pages. If you go to the homepage (http://cecile-chancerel-bijoux.com/wp/), you have the default FR homepage. When you click the US flag, it redirects you to the US homepage. I want the US blog (/blog-en) to display only the posts in English and the FR blog (/blog) to display only the posts in French. How can I achieve this ? And it works ! I eventually have only the posts in french displayed on my french blog page, same for the english one. Thanks @Friss, this is all thanks to you ! Not the answer you're looking for? Browse other questions tagged blog-page plugin-polylang or ask your own question. How to display blog posts on a dedicated page? How to import multiple language mutations to polylang? How to display only the excerpt in the blog/posts page with Gutenberg?